The follow-up to the acclaimed 'zen puzzle' game, Quell, this offers another suite of ingenious levels to relax and test you in equal measure! Featuring another beautiful score from acclaimed composer Steven Cravis, a beautiful 'hand-painted' art-style, Quell Reflect is the perfect game to test your powers of logic, without any hint of frustration. The game also features a continuation of the side narrative - a touching story of love, loss and nostalgia. 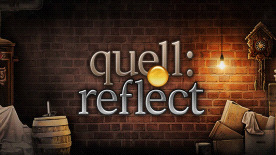 Like the original Quell, Quell Reflect is a haunting experience that will stay with you long after you've finished it.